Phew. I was in irons for a while, taking over a year to complete a tack, passions luffing as I eased my bow through the eye of the wind. I wondered if the sails were ever going to fill again, and held my breath as she hung there… weathercocking with indecision, a confusion of wavelets slapping my aging hull. Hell, I thought, maybe I should fire up the iron genny and trundle off to another waypoint… or just swallow the anchor and quietly curl up somewhere to putter into my dotage. But no! All my recurring gizmological fantasies, given enough over-analysis, can be mapped onto floating substrates. Those underwent wild fluctuations during this past year of relentless back pain, from industrial-scale Microship-deploying motherships to geeked-out trawlers… with multiple variants scatter-plotted across that spectrum. Meanwhile, 2014 was a perfect northwest sailing season of watching boats scoot by, living aboard with furry Isabelle and contemplating unfinished projects… dock lines growing crusty enough to inspire jokes about potting them in epoxy. 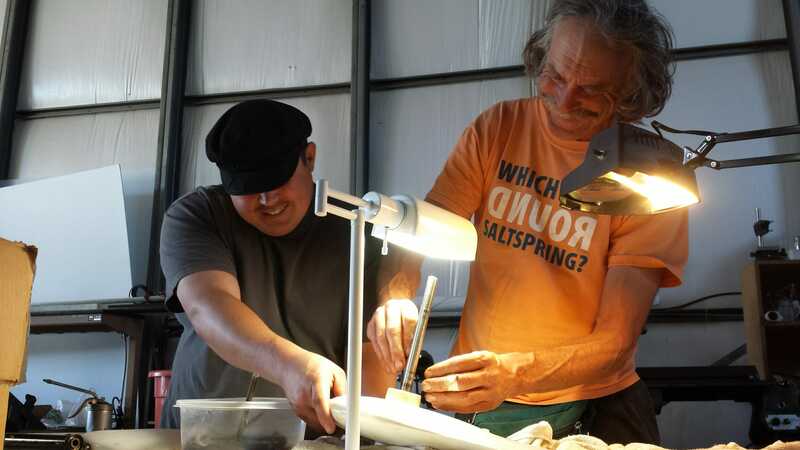 Hobbling on my battle cane, I would launch myself on daily walks to decide how to complete that life tack, schlepping my trusty lab notebook and geeky pencil with an eye toward finding a spot for inspired noodling. 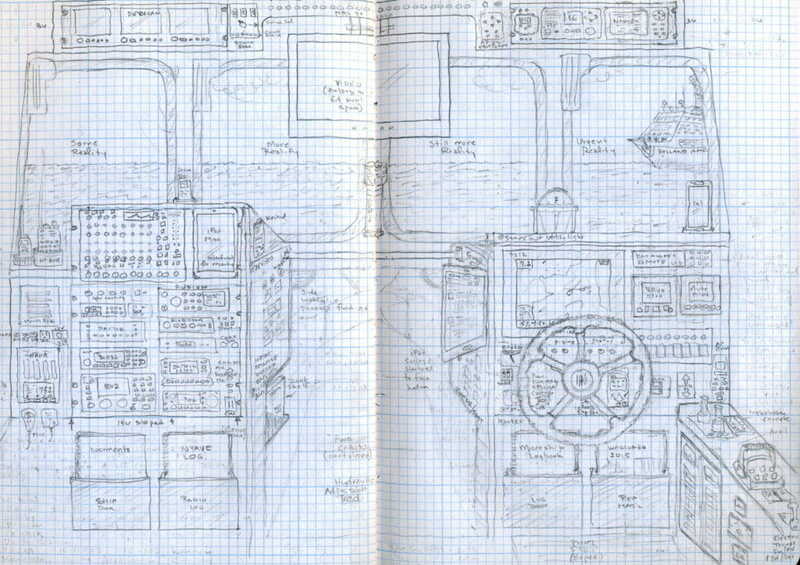 More often than not, strolls through the Port would land me on a friend’s Ranger 27 tug… where my notes and sketches evolved over a few weeks into something that began to look alarmingly possible, and even fun (see sketch above). Maybe that’s it… a trailerable tuglet retrofitted with solar/electric hybridization, stuffed to the gunwales with blinkies and bristling with antennas like a Soviet fishing trawler… yet small enough to gambol down the Interstate and embark on the Clueless and Lark expedition (or, more likely, the Great Loop). This became an obsession, and I spent much of the summer designing and researching, getting on the water in OPBs, devouring the friendly Tugnuts forums, visiting the Ranger factory in Kent, attending a rendezvous in Roche Harbor with Rebecca, then wrapping up that weekend with a jaunt back to Friday Harbor around the west side of the island (eternally grateful to my friend Paul for trusting us with the Maggie E, as he monitored our track from afar via AIS). Before I can do more than fantasize about new nautical toys, I must reclaim space and budget from old ones… I cannot afford, nor do I have the space for, an armada. 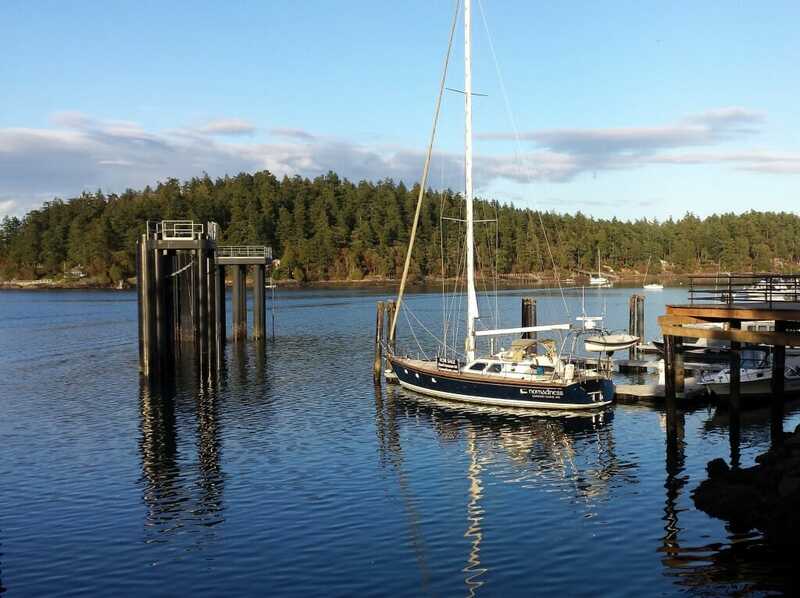 The elephant in the room is the lovely Nomadness, bobbing hopefully at her dock in Friday Harbor and sporting a URL banner jokingly dubbed the TrySale. I am doing all I can to avoid brokers (for a host of reasons; don’t get me started…), and have had a few inevitable showings to people looking for entertainment while visiting Friday Harbor, as well as a dozen or so interesting email inquiries from the page of details. Of course, it would be most delightful if the next owner has an expedition in mind, and I can sweeten the pot with some integrated geekery. I have already done a lot of the design work on data collection tools specific to Nomadness, and sending my beloved boat out on a remote expedition while she streams system, environmental, and biological data to a database-backed web server here… mmm, well now, that sounds like some good fun. My interest in embedded sensors and telemetry has been rekindled by this notion, leading to Yet Another Learning Curve. Five years have passed since my last serious design efforts in this domain. At the time, my assumption was that there would be an always-on Technologic TS-7800 embedded ARM board fronting a power-cycled Mac Mini (the “big iron”) for archiving, graphic UI, and development. These would sync frequently and share a USB hierarchy of about 15 Arduino nodes scattered around the boat, each devoted to a local region, and there would also be a variety of streams from existing data-centric systems such as NMEA2000 and the Outback power system. That design was very sensible in the context of obsessive technomadic excess, but the past half-decade has brought a few developments that simplify the data-collection challenge. Most notably, it’s gotten cheap… and for a few nickels we can scatter horsepower and gigabytes of storage wherever needed. It has become a bit redundant to hand-off responsibility between a power-efficient embedded system and a robust chunk of big iron; with tools like the Raspberry Pi ($35) and BeagleBone Black ($55), we can let one board with 64GB of flash take care of the hub and user interface environment, then deploy a few on the ship’s LAN to support sensors and protocol translation. 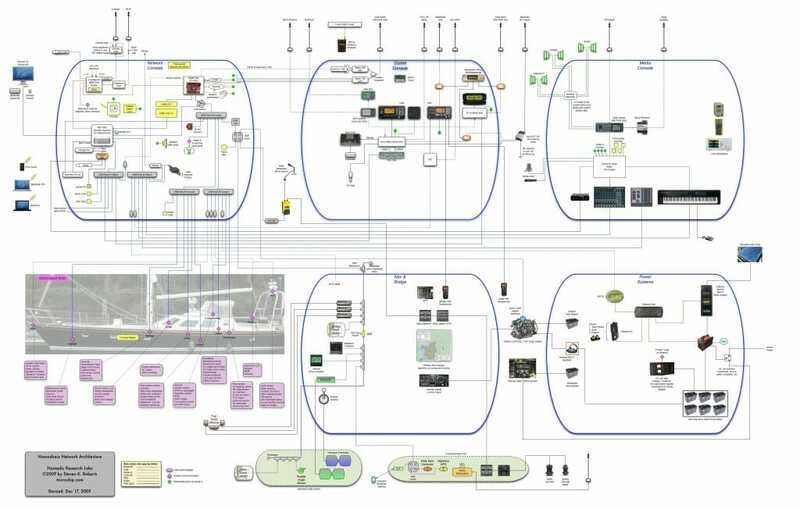 The community around these things is huge, translating into lots of add-on interface boards (I just got one of these), and so many solutions have been published that one can conjure an entire telemetry system with a C-note and a few hours of spirited Googlage. Like the Arduino community, this class of computing has become very accessible. Of course, this is all abstract until I actually use it for something, so rather than wait to see if Nomadness will sail the seven seas streaming a wake of data, I bought a machine to install in my backpack. 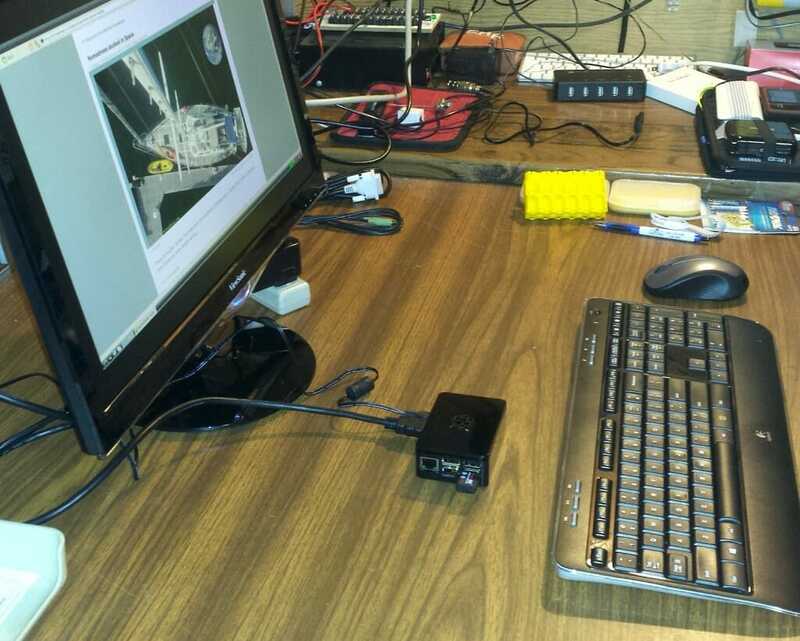 In this photo, I have just installed Rasbian from the NOOBS included on the microSD card that came with the Raspberry Pi starter kit (with another $25 adding a 5-megapixel camera tucked into the same little black box that talks HDMI to the monitor and WiFi to the Net). It was insanely easy to get to this point, and I’m now finding my way around the Python IDE, Wolfram Language, and GPIO interfaces to sensors. Getting from here to stuffing time-stamped measurements into an SQLite database is not particularly daunting, and the final hop involves transmitting a subset of that via various communication pipes to a web server that includes a few graphing tools to make it purty. Along the way I’ve gotten interested in making a homebrew NAS to replace the confusing HooToo gadget attached to the 2-terabyte hard disk that lives in a Grid-It slice of my 5.11 Rush 24 backpack, just under the Verizon Jetpack between battery bank and 5-port USB charger. Ah, the times we live in! I’m hobbling around town with enough file space to carry 2.5 million novels, 40 gigabytes/month of connectivity that averages over 25 megabits/second, about 30 amp-hours of Lithium-Ion batteries, scanner, software-defined radio, dual-band ham rig with packet capability for tracking and datacomm, two serious computers (one called a “phone” because it comes with a voice communication program I rarely use), wicked LED flashlight, thermal camera, weather datalogger, a few favorite tools, crypto and memory dongles, a sling, basic first aid supplies, Makers Notebook, and gizmos various. Oh, and a water bottle. No wonder my back hurts! OK, back to boats, and the surplus thereof. Before I can seriously contemplate rolling a trailerable tug into a lab already piled high with artifacts, I need to open about 250 square feet of floor space… the Microship parking spot. This boatlet was the product of an obsessive decade (1993-2003), then she sat for another decade before joining me in local waters for a swan song in 2013. That summer was so delightful that many of my subsequent noodlings about the post-Nomadness epoch involved motherships that could crane-launch the micro-trimaran from an upper deck to take exploration breaks from laboring in my mad-scientist lair below. Scaled Technomadics, I called it, dreaming of rumbling into an interesting cove and dropping anchor, spinning down the big diesels, then hopping into the amphibian sprite to poke around under pedal, solar, and sail power. Realistically, of course, that is unlikely to happen, so I’ve been keeping my eye open for a suitable young madman who would be well-matched to this machine. Lo ‘n behold, an event is coming up that would be just perfect… the Race to Alaska, a 750-mile jaunt from Port Townsend to Ketchikan that launches June 4, 2015… with a $10,000 winner-take-all pot! And, it turns out, there’s a fellow here on the island who has fallen in love with the Microship and is keen to do exactly that. 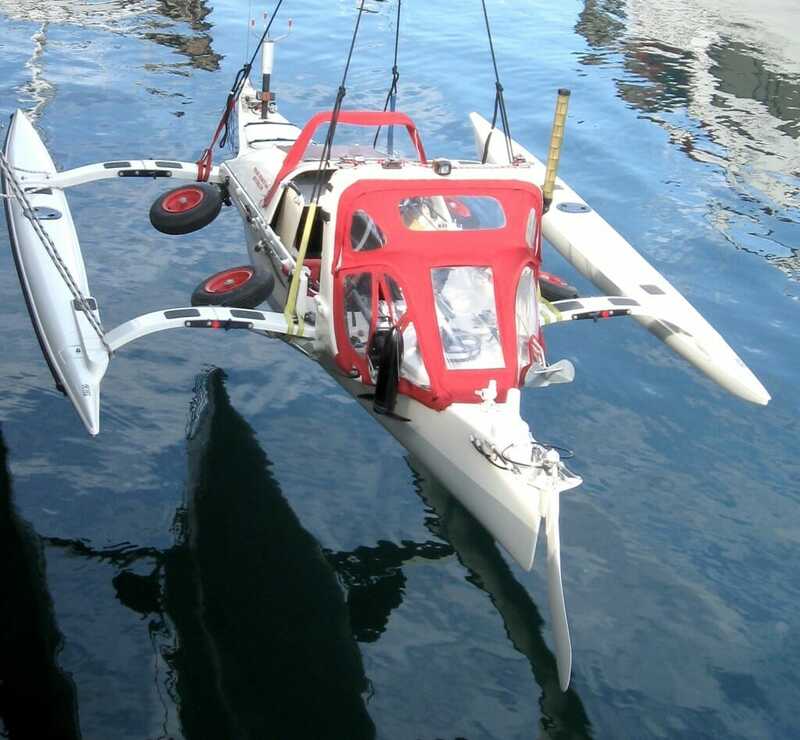 He has already moved the boat to a neighboring shop space and (with the help of Mark Coulter, visiting via his trimaran from Salt Spring Island) rebuilt the Spinfin pedal drive unit that was damaged by a boat-intruder at the Port in 2013. It is now spinning more freely than ever, and is ready to hit the water; the only other big job is some repair to leaky steering hydraulics that led to my marginally effective on-water bridle kluge. I’m looking forward to seeing the Microship afloat by February, with Nick grinning at the helm as he imagines future technomadic adventures. NOTE from June, 2016: that did not happen. The boat is still available. If all goes well, he will acquire the boat, do the race under human and sail power, then attach the solar array to return from Ketchikan and begin a more sanely paced exploration of the Salish Sea and points beyond. This would be a fitting legacy for the project, which was intended to be a geeky platform for prowling coastal and inland waterways. We will have to figure out “branding,” since the Microship name has been my primary project moniker since about 1993… although it was disturbing to discover recently while Yachtworld-surfing that someone gave that name to a Defever 49′ trawler. Anyway, all that dovetails nicely with the system we are designing to provide a “virtual console” for these ships. We could eventually end up with three floating data sources (plus the gratuitous test system in my backpack), streaming hundreds of telemetry channels to a server that can display simulated instruments, historical graphs, and animated cartoon ships reflecting on-board inertial reference systems (the kind of thing that used to require expensive military-grade gyros). Ain’t technology wonderful? Now that there is a semblance of an actual plan, life is starting to seem fun again. I’m getting back to the High Tech Nomad book project (with a corresponding Facebook page if you’d like to join us), and resuming additions to the technomadic archives. And now that I have a more spacious place to hang out when not puttering in the lab or working on tonnage reduction, I’ve resumed tickling the ivories. A new Kawai MP7 is drool-inducing, but I’m going to keep my GAS in check and stick with the delightfully capable PX-5S (25 pounds, and svelte enough to tuck into a future tuglet, should that materialize). The community around this rig is huge, and I have parked it on an adjustable steel workstation to optimize ergonomics and give me a place to hang monitors, computer, stereo, mixer, looper, ham gear, recording tools, microphone, and all the other audio stuff that has been languishing for too long on the shelf. With that, it’s back to geekery! I look forward to posting, hopefully soon, with good news about the Skipperquests… and with luck, I’ll be adding a live data feed from the Datawake-development system. 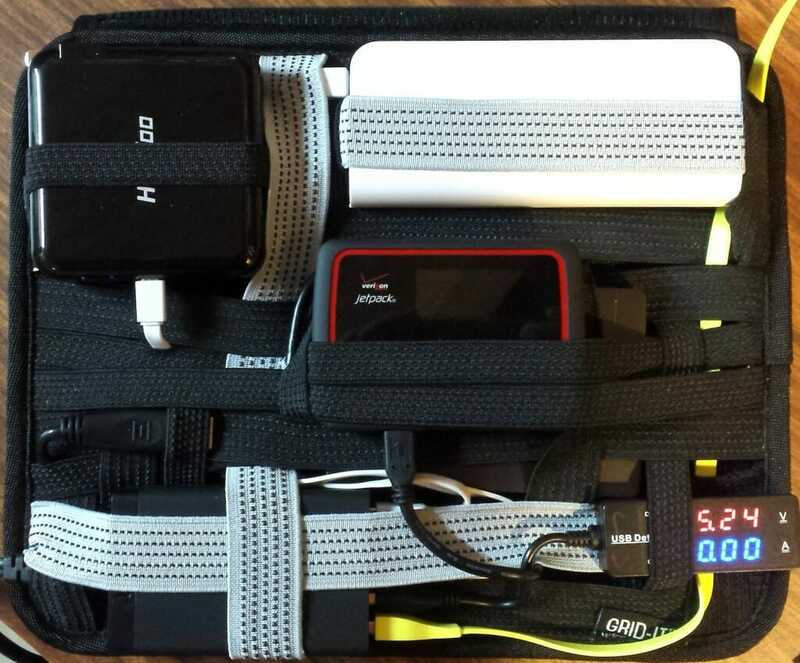 Thanks for mentioning our ppDAQC board in your blog – can’t wait to see your finished project! I was so happy to see your most recent post with its positive notes. I “idolized” you in junior high/high school. Bicycled cross country in 1987 after my junior year in high school, on and off active ham and stunned to find you lurking in the San Juans. We aren’t sailing around the world with 5 year old twins, but we boating the local waters with an excessive amount of electronics. Hopefully your pain subsides and you start exploring soon. Hi Howard, and thank you! I was on the road at the same time (1987); sorry we didn’t cross paths! Glad to hear of the excessive electronics… gives one a warm feeling whilst puttering about out there, traditionalists notwithstanding. (It’s a recurring theme, as you might imagine; when folks give me a hard time about too much tech, I point out that first, it’s my particular passion, and second, they probably carry lots of fancy gizmology too… but defined as essential marine electronics). 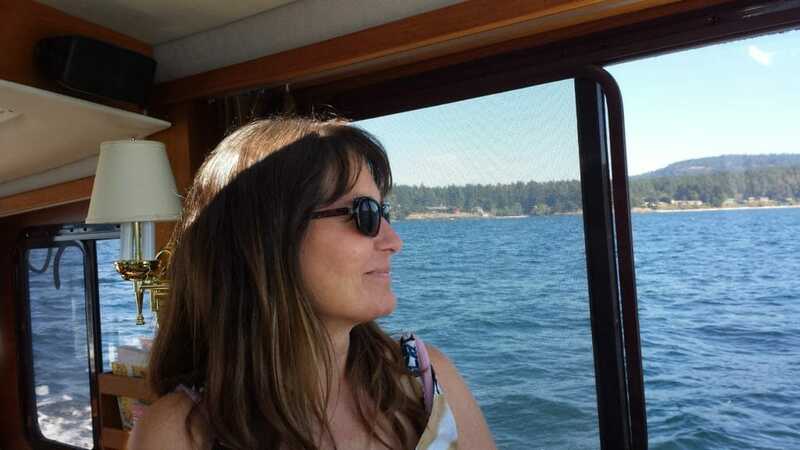 Anyway, look me up in Friday Harbor sometime… would love to swap tales of cycling adventures.